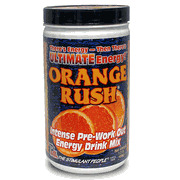 Orange Rush is the ultimate workout drink mix containing protein and carbs. A grueling training session makes your body crave carbs and protein. Orange Rush contains the optimal protein and carb mix so your body can sustain a stronger workout and prime itself to gain more muscle mass. Every scoop contains a high-density herbal mix, providing a powerful dose of Yerba Mate, Guarana (caffeine), Korean Ginseng, Green Tea Extract, Orange Peel Bioflavonoids and more! How Does Orange Rush Compare? Orange Rush contains 31.25 mgs of caffeine per fluid ounce (105.67mg/100 ml).